Practice Manufacturing Processes questions and answers for interviews, campus placements, online tests, aptitude tests, quizzes and competitive exams. This set of Manufacturing Processes Multiple Choice Questions & Answers (MCQs) focuses on “Electrochemical Etching – 1”. Explanation: Etching refers to the removal of material from the wafer surface. The process is usually combined with lithography in order to select specific areas on the wafer from which material is to be removed. 2. Deposition is a complimentary process to etching. Explanation: The complementary process to etching is deposition (or growth), where new material is added. Unlike oxidation (or nitridation), where the underlying Si is consumed to form the oxide (nitride) layer, in deposition, new material is added without consuming the underlying wafer. Explanation: A controlled portion of the wafer surface is exposed to the etchant (mix of chemicals) which then removes material by chemical reaction. 4. ________________ is used to protect the remaining area of the wafer while machining. Explanation: There is a chemical reaction between the wafer surface and the etchants that helps in material removal. Either a photoresist layer or a hard mask like oxide or nitride layer is used to protect the rest of the wafer. 5. The time for etching is independent of material to be removed. Explanation: The time for etching depends on the amount and type of material that needs to be removed. KOH (potassium hydroxide) is a common etchant used to remove Si. 6. Wet etching is used for removal of material from large areas. Explanation: Wet etching is used for removal of material from large areas (trench sizes > 3 µm). For smaller areas, where greater precision in the removal of material is required, dry etch is preferred. Explanation: The wet etching process is anisotropic i.e. the etch rate depends on the plane of the atoms in the material, from which atoms are being removed. Explanation: In incomplete etch, the time is not sufficient for complete material removal. This is usually due to concentration or temperature not being sufficient. The concentration profile left behind is usually a rough surface, due to local variations in material removal. 9. Product after etching of Si wafer with KOH is ______________ shape. Explanation: Because of the difference in the etch rates of Si along the different crystallographic layers the final profile is trapezoidal, with the angle determined by the etch rates. 10. In case of over-etching, material under protective layer gets removed. Explanation: When the etch time is larger than the required etch time, due to isotropic etching, material under the photoresist can get removed. This is called over etching and in extreme cases, it can also lead to liftoff the resist layer. 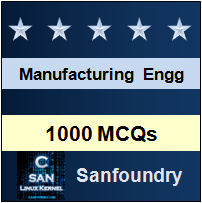 Sanfoundry Global Education & Learning Series – Manufacturing Processes. To practice all areas of Manufacturing Processes, here is complete set of 1000+ Multiple Choice Questions and Answers.